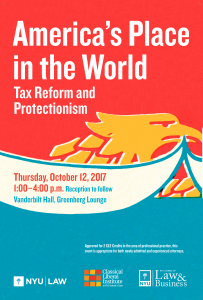 This two panel conference will focus on Tax Reform and Protectionism issues in the United States. Under the Trump administration, there have already been many proposed regulations that will affect American jobs and free trade. Our discussion will focus on the American economy and the global markets at large. President Trump plans to lower corporate taxes and streamline regulation on import and export taxes, in the hopes of enticing companies to remain active in the US job market. While this has energized the business world, conservative economists are wary about Trump’s trade instincts and protectionist initiatives. Our first panel on tax reform will also address individual income tax, as well as taxation at the corporate level. This will lead into a discussion during our second panel on using tax reform as one of the ways to accomplish a protectionist agenda. Participants include: Lily Batchelder, NYU Law; Joshua Odintz, Georgetown Law; David Kamin, NYU Law; Justin Muzinich, U.S. Department of the Treasury; and Annette Nazareth, Davis Polk & Wardwell LLP. This symposium is jointly sponsored by the NYU Journal of Law & Business and the Classical Liberal Institute. The event has been approved for 2 New York State CLE credits in the Areas of Professional Practice category. It will be appropriate for both experienced and newly admitted attorneys.